What they actually said was “Peach has thought for a while that Leicester wasn’t the right site for a Peach gastro-pub offer”. I don’t want to come across all defensive, in fact in a way I kind of agree with them. But what I would say is that it might have been the right place if that offer had been a bit better. I liked the place – staff were great, it was nicely done out and was a good, welcoming place to go in the daytime. It made all the right noises about “honest and ethically sourced” food, and I remember one rather good lunch when it first opened. But on subsequent visits, the food just wasn’t quite good enough, and most other feedback I received wasn’t over-enthusiastic.. There was poor cooking on occasions and dishes that just left you thinking they didn’t measure up to their promise. Peach say they never lost money on the place but couldn’t “make it work”. They took the chance to get out when they had an offer from Turtle Bay, the Caribbean chain that opened last year in Nottingham. Peach meanwhile is carrying on expanding in its core environment of well-heeled market towns. A shame then. It could have been a beautiful relationship, but I suspect both sides are left thinking “It wasn’t me, it was you”. Recently I’ve heard more widely diverging views about The Almanack than any other venue in Leicester – some love it, some have been disppointed. It makes life a little difficult for itself by its urban gastro pub schtick, its upfront detail on provenance and quality and its pretty smartish restaurant pricing. It says “we’re quality” and it needs to deliver. I remember a very pleasant lunch when it first opened, but subsequent visits have been a bit ordinary really. I really like the feel of the place and staff are generally charming and helpful. In the context of Highcross it’s a lovely little retreat. We met for lunch this weekend and I picked the ‘favourites deli-board’. 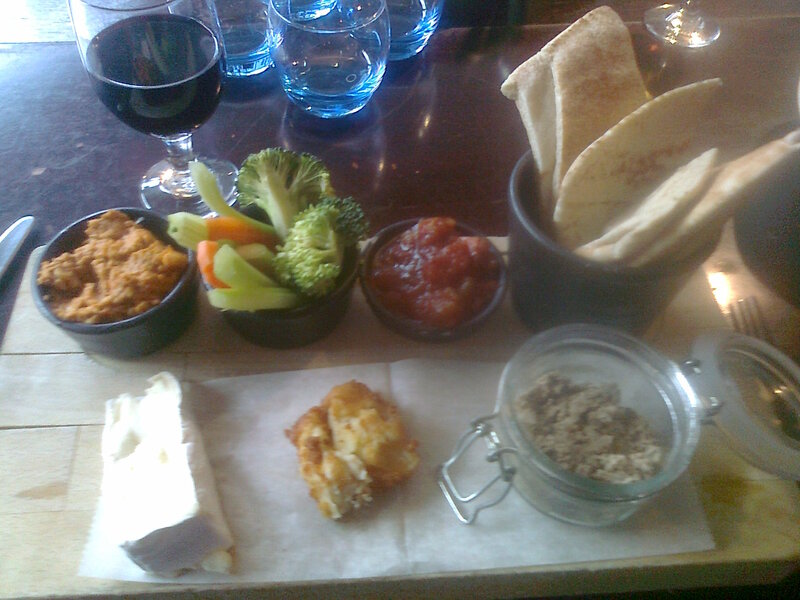 Very nicely presented it included a decent pork liver pate, some very good spicy hummous, a tasty little haddock fishcake type thing, a slice of fairly ordinary brie, some crunchy raw veg, homemade tomato chutney and pitta bread. It was all good stuff – if I’d stopped off the A1 on a drive north and found this in a random pub, I’d be pretty happy, but it wasn’t something to make a song and dance about. At £11.50 I would not say it was tremendous value. I was meeting up with old friends so we had lots of stories to share, but tellingly none of them felt moved to break off and make any comments about their lunches. So my take on The Almanack is a lovely place to take time out from the shopping hustle and bustle. I want to be on its side and I’d not baulk at going back to eat but the feeling lingers that it’s just not quite as good it could be and wants to be. Clarissa Dickson Wright – not her biggest fan but she’s had an extraordinary life and I think I’d trust her judgement on pigs and pork. So it was good to see her on BBC 2 on Wednesday night scuttling around Rutland’s Northfield Farm with Jan McCourt Farm admiring their new English Lop boar. I’ve been thinking a lot a about pork recently, partly inspired by a recent conversation with Tom Cockerill about rare breeds and also because of a revelatory pork chop from the fine Archer’s butchers on Queen’s Road, Leicester. The quality of the meat came out in the way it felt in the pan but mainly obviously in the eating quality – tender and deeply flavoursome, it seemed simply a different order of substance from some chops I’ve had. 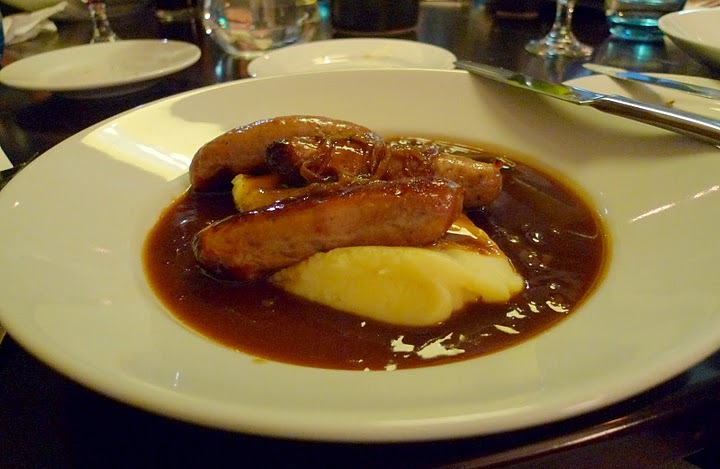 So my interest was piqued by a message from Leicester pub The Almanack that is organising a hands on Pork to Fork day out at the Peach Pub company’s farm in Oxfordshire on Saturday week. They promise you can learn about how free range pigs are turned into succulent pork, and butchery skills from a whole carcass down to chops. There’ll also be lessons in how to cure a ham and make sausages. At £125 (including roast pork lunch and other treats) it’ll only be for the truly committed – if that’s you, see more details at the Almanack’s website. Had a quick return trip to The Almanack in Leicester’s Highcross this weekend for their “Jazz and Puddings” evening on Sunday. It was a very pleasant way to finish a weekend – a lively but informal buzz with families and groups of friends winding down, eating, chilling and in our case, playing jenga. The impression of a stylish venue that is eager to please was confirmed, but so was a sense that not everything is running quite as smoothly as it should. Booking for the event was a little chaotic apparently, and there were a few slapdash things about the food. Most seriously my slowcooked rib-eye of pork had not been sufficiently reheated and remained cold in the middle – it was edible and I didn’t make a fuss but it was not charged for and my comment was dealt with swiftly and sympathetically. The buttterbean and paprika stew that it came with was wonderful and most of the eight of us were broadly positive about their meals ranging from sausage and mash to a caeser salad to roast lamb. For deserts we all shared three of the special deliboards – an assiette of puddings including ffuit salad trifle, rhubarb crumble, a chocolate brownie and a lemon meringue parfait kind of thing. 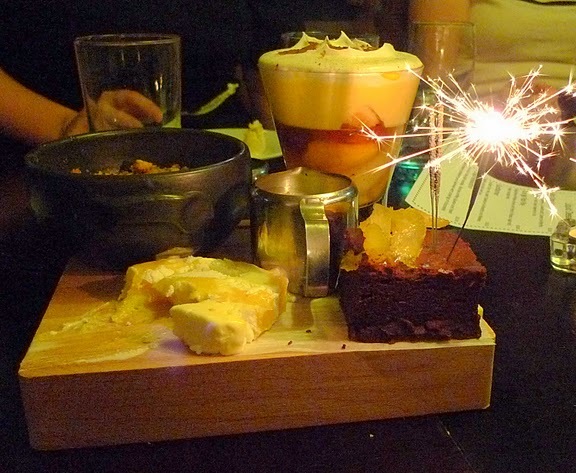 They were presented with fireworks and in the main were totally delicious, the parfait in particular. The trifle started off wonderfully with a tremendously boozy syllabubby topping but was let down by some tasteless, seemingly tinned, fruit. Finally got around to lunch at the Almanack in Leicester’s Highcross. Most feedback I’ve had about this modern “urban gastropub” has been very positive, and even those who had issues with the food were very impressed with the response of staff. This seems like a place that genuinely wants to succeed by keeping people happy. First plus point was good beer. Earlier in the week I’d been in a big chain pub around the corner and found they had no draught ale – just lagers or wretched “creamflow” bitter. So it was good to find first rate Purity Pure Gold and Ubu beers available here. That said, while there’s a bar area this isn’t primarily a drinkers pub. On a Friday lunchtime it was doing reasonable food business. The weather outside was foul so comfort food seemed in order and my coq au vin fitted the bill fine. This was very acceptable bistro cooking – good quality, succulent chicken, button mushrooms, crunchy lardons, a rich sauce and excellent mash. It had a rough-around- the-edges, home cooked feel and was all the better for it. Gill had salt and pepper squid, which was very tender, beautifully seasoned and served simply with crunchy, raw veg and and a spicy mayonnaise. Deserts were excellent – my pavlova of chewy meringue, cream and pulp of passionfruit and pomegranate was a good example of keeping it simple and letting the flavours speak for themselves. Gill was very happy with her baked bramley apple stuffed with dates and pinenuts with a caramel sauce. Excellent flavour combinations and good execution. Staff were unfailingly cheerful, despite our waitress having been on duty since 7.30am, and competent too. It’s not all that cheap, but if you want cheap food there’s a Wetherspoon’s round the corner and your welcome to it. There do seem to be plenty of offers available, we were paying £12.50 for two courses, and the menu is diverse enough for a wide variety of appetites and pockets. 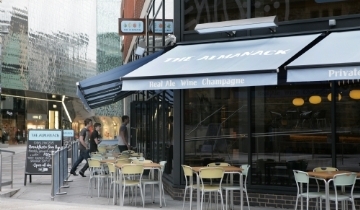 Well run, welcoming and with good quality food – a big welcome then to the Almanack . A quick spin around Highcross this morning showed work is progressing apace on the Almanack. I’ve got moderately high hopes for this venture (located near the Highcross Street entrance – opposite Canas Y Tapas). Owners the Peach Pub Company appear to have done a good job with the Kenilworth gastro pub of the same name. Co-founder Lee Cash worked with Raymond Blanc for eight years and appears to take sourcing very seriously, joining initiatives such as Scottish Skippers Scheme, linking up chefs to trawlermen so that chefs are able to plan for what is in the catch. All their chicken and pork is free range, and the company – which has I think around eight pubs now – won a Caterer award recently as one of the best places to work in the industry. The Kenilworth pub offers food all day round, under direction of Corin Earland, and while fish and chips and sausage mash are on offer, so is a wide range of more unexpected fare – salt & vinegar baked beetroot with spiced lentil salad or pan-fried Welsh sea bass, sauteed leeks & artichokes. There are also “deli boards” for under a tenner offering combinations such as smoked mackerel pate, prawns in marie rose, sweet cured herrings, fish goujons, beetroot tartare sauce and rye bread, or a cold cuts board with free-range ham, roast beef, chipolata, pate, piccalli and warm bread.